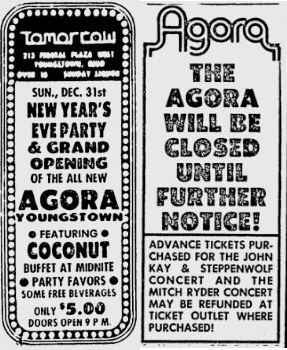 After $200,000 in renovations, the Tomorrow Club-era gave way to the famed Agora brand on December 31, 1978 when Youngstown’s branch of the 13-club national concert venue chain opened at the State Theater site on Federal Plaza. The Tomorrow Club’s last official day was December 22, 1978. The transition took eight days. The renovations included a new roof (I think this was probably the last time the venue had significant roof repair work done), facade restoration, new signage and interior repair including a bar on the mezzanine level. The club also positioned itself to record shows like the famous Cleveland Agora although I’m not sure how many actually were put down to tape or broadcast. An article in The Jambar from 1979 indicates that the Youngstown Agora had the largest capacity of any venue in the chain at the time at 2,142. The end of the Youngstown Agora came suddenly on July 23, 1982 when an ad in the Vindicator signaled that the club was closed until further notice. There had been attendance issues and battles with city officials over concert-goer-related vandalism in the area in the last months of the Agora’s existence. The marquee read “Closed for the Summer” during the week the doors were shut illustrating faint optimism by club management that economic conditions would improve and allow the Agora to rise again. It did not (all but the one in Cleveland did not survive the 1980s). BRQ Inc., headed by Jack Gerchock, filed for Chapter 7 bankruptcy later in the year. The company listed assets of $10,000 and liabilities of $277,152. The venue began hosting concerts again in May of 1983 under the original State Theater name. That only lasted a few months, however. Did the Greatful Dead ever play at the Agora Club in Youngstown , ohio? No. The Grateful Dead were basically an arena or large outdoor venue act by the time the Tomorrow Club/Agora was open. Under age and great memories! Can’t remember the band though. Saw Journey there in the 70’s for $2. Is a great memory! Who wanted to finish college when having the rare opportunity of working with Jack, Hank, Dave, Bob and to many to mention. Not even a plak or tribute to the finest Promoters of Rockn’Roll. Of course, Bill Graham. Trust that the Youngstown Ohio Tomorrow Club/Agora was the Chappell you had to go through to find the “holy grail” ..